I finally did it. I finally watched Alien! It only took until I was 35 years old to do this. I can’t even tell you how many years it has been that I have wanted to watch this movie, and how each passing year I would promise myself that this would be the year to watch it. Well, I finally did, thanks to my husband forcing to me. So as crazy as it sounds, despite how old this movie is, I still knew next to nothing about it before watching it. Obviously there was something an alien, and that was about it. I can’t say that this movie was overly memorable. In fact, I’m having a hard time thinking of what to say about this one. I guess the one thing that stuck in my mind, and at some times bothered me, was the cat. I feel like the only reason the cat was put in the movie was to inevitably screw over the crew. I mean, I was pretty much yelling at the TV when Ripley went looking for the cat while they were trying to escape the ship. I kept saying “Leave the cat and get out of there!”and “You can get a new cat when you get home!” Let’s face it, if it wasn’t for her chasing after that cat, she would have been able to have a much cleaner escape and the alien wouldn’t have snuck aboard the escape ship. Speaking of which, who didn’t see that coming? I mean come on, the door was left over to that ship and no one knew where the alien was, so of course it’s going to get on board when no one is watching. In the end, I’m glad I finally watched it, because people always thought I was crazy when I told them I’ve never seen Alien. I will continue on with the rest of the movies at some point, just to say I have watched them all, but I am in no major rush to do so. This entry was posted in Movies, Science Fiction and tagged Movies, Science Fiction. Bookmark the permalink. I was maybe 9 years old the first time I saw this? It was the scariest thing I’ve ever seen. For a Space Horror movie, Alien was groundbreaking. Compared the movies that have come out in the last 10 years, I can see how this one wouldn’t hold up. I can only imagine how terrifying it would have been seeing it at that age. It definitely was a great scifi horror, or at least it was for it’s time. Sadly, I’m pretty desensitized to horror, so nothing really scares me, but I can appreciate how it must have been scary to many people, especially upon it’s release. Horror movies now, scifi or not, just can’t hold a candle to the old school scifi movies. 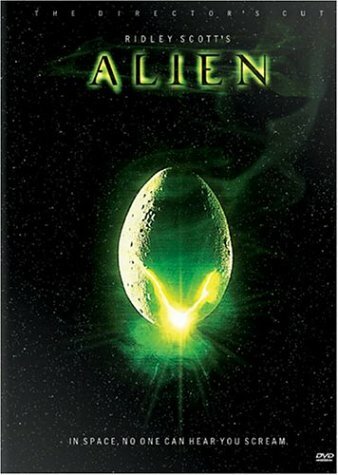 Alien is a pretty iconic movie, sometimes with such movies if you go into it expecting to much you will be disapointed. Aditionaly, as was mentioned were have been spoiled by some many big budget sci fi tent pole movies the last decade I can see how it may not have held up. Sometimes you just don’t like a move, I have tried to understand the popularity of Clockwork orange, and I just can’t get into it. I definitely think that being used to the current big budget films definitely made the film seem a little lackluster, it’s why I believe that if I had have watched it years ago, I would have enjoyed it more. I still enjoyed it, but certainly not as much as I thought or hoped that I would. Still happy that I finally say it and will need to watch the rest of the movies at some point. I do not understand the popularity Clockwork Orange at all. I watched that one a few years ago and still regret it. I adore the set design and atmospherics of Alien, and the humanity of the crew. They feel like they’ve known each other for ages and are heartily sick of each other; especially the way the 2 engineers troll everyone. But I get that for anyone who loves horror it’s going to seem pretty tame – I think it’s an excellent slow building thriller, but I guess it’s all very predictable when you’ve got more context). I’m not a big fan of ‘you’ve got to see it in its context to appreciate it’ – I think a book/film has to stand on its own merits – so it’s always intriguing to see a new perspective! I agree, the crew dynamic was great, especially the engineers. I would definitely classify it more as a thriller than a horror. Still a neat movie and I’m glad I watched it.